Then use the tutorial for dumping your NAND and also Flashing Xell and Freeboot. 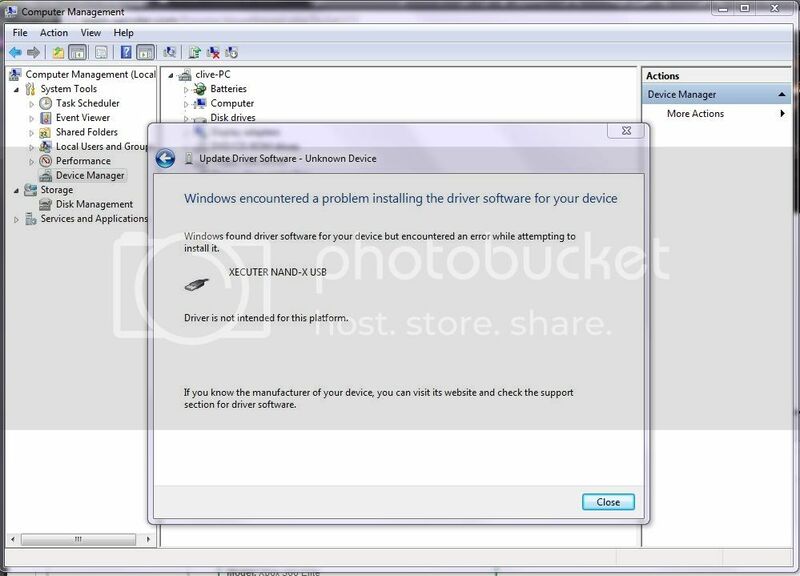 These examples show the drivers being installed on a Windows 7 machine. The process is pretty much the same on XP and Vista - both 32bit and 64 bit. 1. Goto Windows Device Manager. Plug in the Nand-X via USB. You will see a device called "MemoryAccess"
2. Right Click on 'MemoryAccess" and select "Update Driver Software..."
3. Select "Browse My Computer For Driver Software" - It may say something different in XP or Vista - just choose the manual option and not the auto option. 4. Select the folder where you unpacked the drivers that you downloaded. The example shows they are on the C drive in the nandpro_20d_drivers folder. make sure the sub folders box is ticked. 5. If you see this warning sign just select "Install This Driver Software Anyway"
6. Success. Simple wasn't it ? 7. Once installed correctly this is how the Nand-X is listed in Device Manager. I have a jasper and unknown all the other stuff. I just bought a nand pro from acid modz and when i get it is this all i have to do then im ready to dump the nand once i finished with all the quick sodering?? It works fine on mine. Try restarting your PC and remember that you're using the x64 drivers. You will see this is in Capitals...... Delete it and it will work fine. I had the same problem now and was pulling my hair out for 10 mins. Dont forget theThanks button if I've helped. Does this pack of drivers work for 86 n 64 bits? Having awful issues getting this to work followed steps to the letter and still wont work I am getting the same message as the person posted prior to this. at this point I would be happy to get cannot detect flash controller instead i get cannot find usb device. I have already had the drivers on here before deleted when nand x failed. Got a new nand-x coming that will already be updated to the new firmware. I have the 20d drivers installed. Are these OK? For RGH, v3 is going to be required. the v3 drivers in the nandpro v3 archive do not work with the nand-x you have to use the drivers in this thread. Brilliant tutorial. But will NandPro 2.0x work with the the new V3 code NAND X's? I've just purchased a NAND X and it has the new V3 code. i feel like a complete tard right now, i cant get the drivers for my nandx to install correctly, i dont remember it being this much trouble the last time i used it, i hookrd it up follwed the directions, and bam it worked. now im getting a error saying DLPortIO is not in stalled after i followed the tut to the T. any help would be nice.